Our aquaponics garden runs year-round (the fish don’t take summer vacations) and our raised bed is open for business Fall, Winter and Spring. Our intense Florida heat forces a shut down of our beds, and I don’t much enjoy being outside tending to the garden while sweating like a pig! With so much produce, I like to either dehydrate or cook/freeze our vegetables. We’ve canned a handful of times, but found the process too cumbersome to do regularly in the old kitchen. Plus, that time I slipped and spilled 4 gallons of hot water in the kitchen? Not fun. I took the Ball’s brand new product, the Electric Water Bath Canner & Multi-Cooker for a test last week. I made a big batch of Marcella Hazan’s Tomato Sauce with Onion & Butter to gift to a friend. 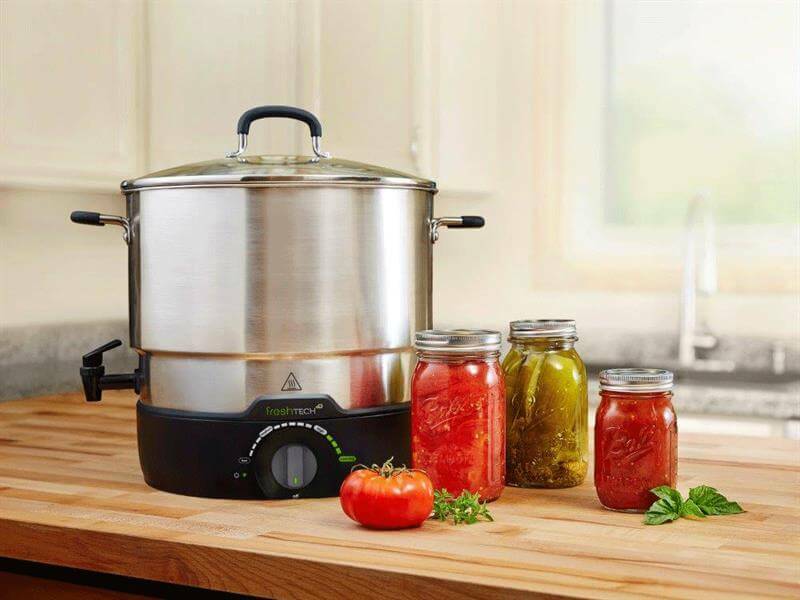 First off, this electric unit is more than just a canner, it also can simmer soups, cook marinara sauce or serve warm cider for a party (a BIG party!) Because it’s an electric appliance, your stovetop is free to do other things. This is great for potlucks, churches or organizations serving dozens of people. Note that the Multi-Cooker is big! It holds 21 quarts of water, enough to process 7 quart jars, 8 pint jars or 12 half-pint jars at one time. The FreshTech Electric Canner makes canning for a novice easy and safe. I didn’t have to measure temperature manually, there is a dial that adjusts the heat setting from pre-heating jars to processing the canning. We set the unit right next to the sink, so that our sink hose could reach in and fill up the pot. There’s also a very convenient spigot to drain back into the sink (no more spilling gallons of water in the kitchen!) Inside the unit, is a stopper, so that you can cover the spigot when using the unit as a Multi-Cooker. You wouldn’t want to get food stuck in the spigot. Remove the stopper to drain the water – or if you’re serving Hot Buttered Apple Cider with Rum. Also included in the package is a steaming rack, which is perfect for steaming a whole fish, Chinese style. Another great feature is that the unit lifts up and out from the detachable base – so that it is easy to clean and carry. The glass lid was nice – you can just peer in to see what’s going on in the pot. Silicone handles meant no more fussing about with clumsy pot holders. The Ball Electric Water Bath Canner and Multi-Cooker came with a few recipes, but I highly suggest checking out my friend, Marisa’s blog, Food in Jars (she also has 2 cookbooks that are great too.) 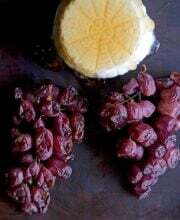 Read up on her Canning 101 series of posts to learn all about jars and canning. As a novice canner, I do like this appliance. The price is high, at $149.00, but if you are using it as a Multi-Cooker for big potlucks are parties, then it is absolutely worth the money. For the occasional canner, it is expensive and big – you’ll have to find a place to store this baby when not in use. 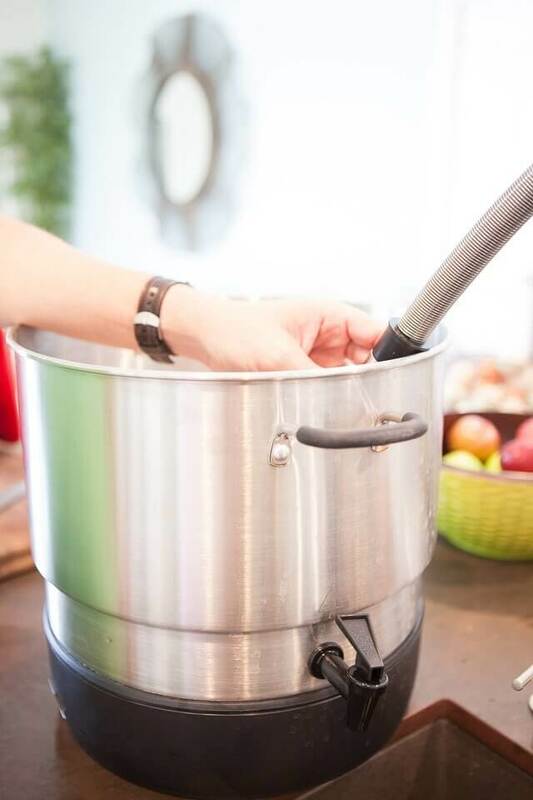 Replace your old, stovetop water bath canner with the Ball 21-qt. 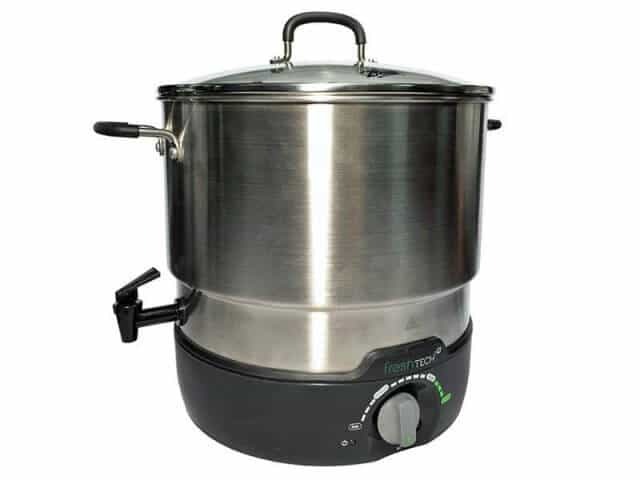 FreshTECH Electric Water Bath Canner and Multi-Cooker, which can be used anywhere there’s a power outlet. 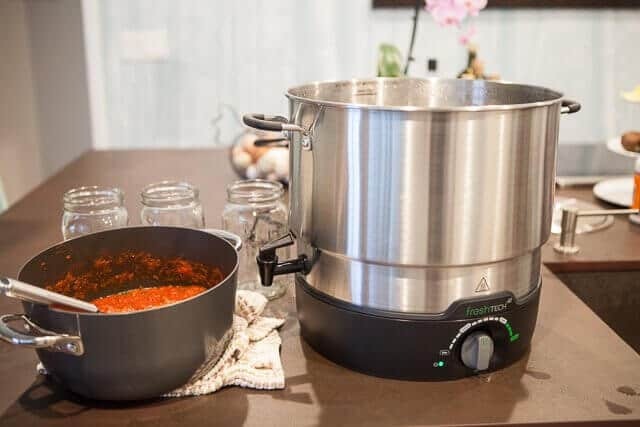 Not only is this electric water bath canner 20 percent more energy efficient than traditional stovetop methods for canning, you’ll free up valuable space on your cooktop for other cooking tasks. This canner accommodates large batch canning, fitting 7 quart jars or 8 pint jars comfortably at one time. 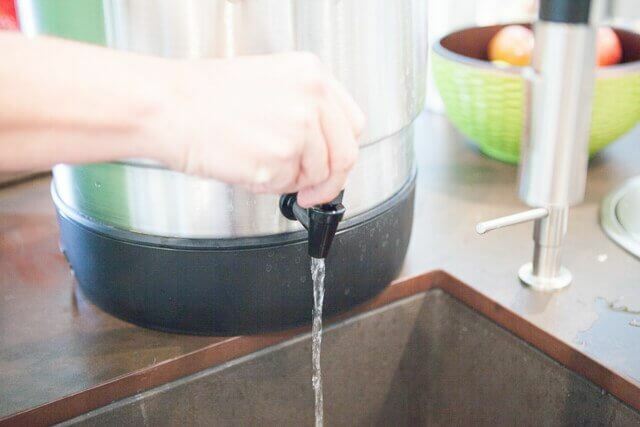 The ingenious drain spout on the exterior allows you to drain directly into the sink or empty water into a smaller container – no need to worry about moving gallons of hot water at the end of the canning process. The drain spout also enables this item to be used as an electric beverage urn, perfect for dispensing hot tea, cider or cocoa at your next party. 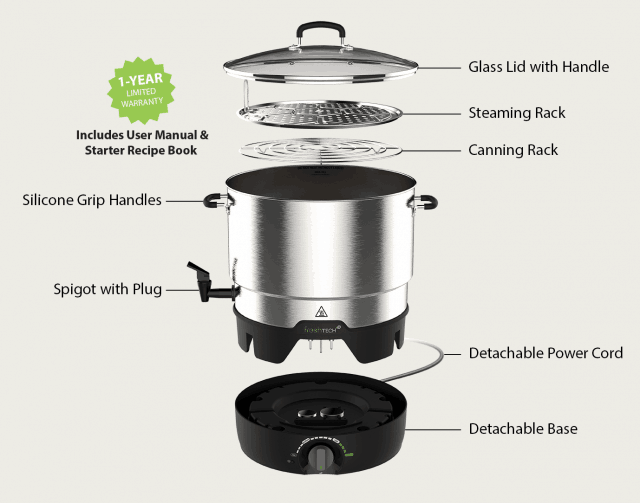 Cook up a storm without using the stove, by conveniently using this electric cooker to steam, simmer, boil, or blanch. 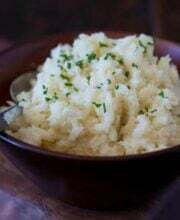 It can be used as a stockpot for pastas, soups, and stews, or as a steamer for vegetables and seafood. Heat-resistant rubber-coated handles on the cooker and lid offer a comfortable non-slip grip. The tight-fitting glass lid allows you to monitor the cooking process without losing heat and moisture. The base is detachable for easy cleaning and conveniently nests inside the cooker for more compact storage. The spiral-bound recipe book takes you from canning to fresh chicken noodle soup.